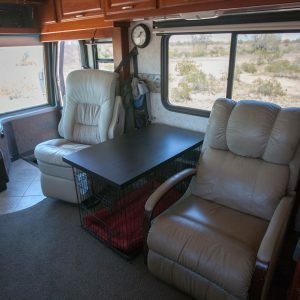 Anyone who travels in an RV with a pet crate knows how much valuable floor space they can occupy. 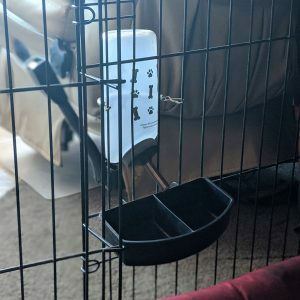 In this post we’ll cover how we “Ikea hacked” our dog kennel to make it a useful part of our living space. Our dog Lily Goodgirl is named that for a reason. She has free roam of the motorhome at all times. Our other dog, Mushy, came to us crate trained when we adopted him in 2017. Since we didn’t know how he’d adjust to life with us, we felt it was best to make the crate a part of our living space so he would be safely contained when left unattended. It was also useful to safely separate the dogs when they’re left at home. Overall, they are best buds, but we’ve had an instance or two of growling over bones and we’d rather be safe than sorry. Also, Mushy loves the crate, and Lily enjoys lounging in it, too. It’s one of the highly coveted nap spots in our Class A, and the dogs would definitely miss it if we took it away. Mushy’s crate is 36″ x 21¾” — a standard size that you’ll find online or in pet supply stores. When we first set it up, we threw a blanket over it so that we could still throw some things on its top in a pinch (since it was close to our entryway), like sweatshirts and backpacks. Pro-Tip: Mushy isn’t a chewer, but if your dog is, you would not want to put fabric on the crate as they might decide to eat it. Overall, this was a fine quick-fix for us. But it was ugly and not a solid flat surface, and we knew we ultimately wanted something better. Tommi started researching (#everyoneneedsatommi) and realized that Ikea sold a Linnmon table top (article number 002.513.38) that was 39⅜” x 23⅝”, the perfect size to rest on top of Mushy’s crate! And for a price of $13.99, there was very little to lose with experimenting in upgrading Mushy’s kennel. We knew we wanted to be able to collapse the crate if needed, so we didn’t permanently attach the table top to the crate. Instead, it’s held in place with wide metal L-brackets. 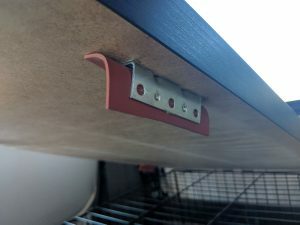 The L-brackets are attached with rubber gaskets to keep the table top quiet and in place. Plus, the brackets help prevent paint scratches. Lay the table top on the crate and center it well. Slip the L-brackets in place against the edges of the crate. We used four brackets total on the sides. Leave a little wiggle room or the top will be very hard to put in place. Use a pencil to trace the bracket locations. Remove the table top and place it upside down on something soft. Use the pencil markings to place the L-brackets, making sure they’re “hugging inward,” and screw them in. Ideally, use counter-sunk screws to make attaching the rubber gaskets easier. Make sure your screws aren’t too long, or they might go all the way through the table top. Cut strips of rubber gasket material slightly bigger than the inside of an L-bracket. Put two small drops of superglue on both inside flat surfaces of an L-bracket. Use a clamp or something heavy to keep the gasket material bent until the superglue dries fully. Pro-Tip: Stay safe with superglue — Tommi chooses to wear the same disposable nitrile gloves that he uses for dump station visits, rather than risk supergluing his fingers together. Alternatively, you could also use wood trim pieces screwed under the table top to keep it from shifting. In that case, the wood is likely to be a bit more visible when installed, so you could stain it to match the table top. As you can see, it’s not fancy, but it works! The table has stayed in place perfectly for over 1 year. We are really happy with how inexpensive this modification was and how well it has served us! 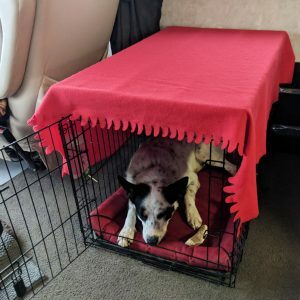 Now Mushy’s crate looks so fancy, we’ve dubbed it his “office.” Granted, we have no idea what business he’s in or what he’s selling, but at least he has a nice space to do it in. This table works great for chatting with guests and gives them a place to put their drinks or serve snacks. I guess it also makes a great arm wrestling platform! 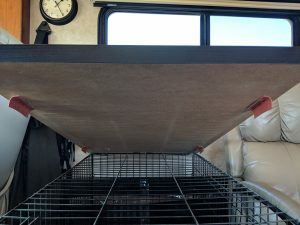 Do you travel with a pet crate? 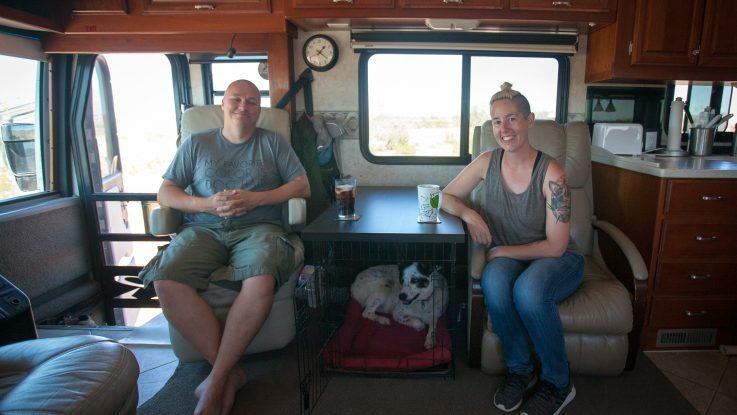 We’d love to hear what modifications you’ve done to make it suit your RV life! Let us know in the comments below. 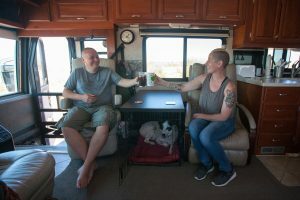 Ane and Tommi, F462447, love how RV life allows them to go on adventures with their rescue dogs. 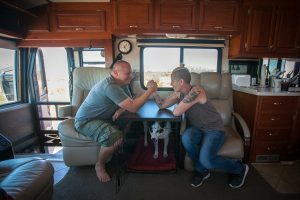 Full-timers since 2016, they share their experiences and review campsites through a pet-friendly lens on Instagram and TheDogisDriving.com. That is so smart! Where did you find the table top that fit perfectly? Thanks! The tabletop is from Ikea.